Kimberley, South Africa, is home to the world’s largest diamond mine, also known as the “Big Hole.” Dug by humans and so large it is visible from space, the pit has yielded some of the world’s largest diamonds and made the De Beers name famous worldwide. The first diamonds here were found by Erasmus Jacobs on Colesberg Kopje by members of the “Red Cap Party” from Colesberg on the farm Vooruitzigt belonging to the De Beers brothers, in 1871. The ensuing scramble for claims led to the place being called New Rush, later renamed Kimberley in 1873. 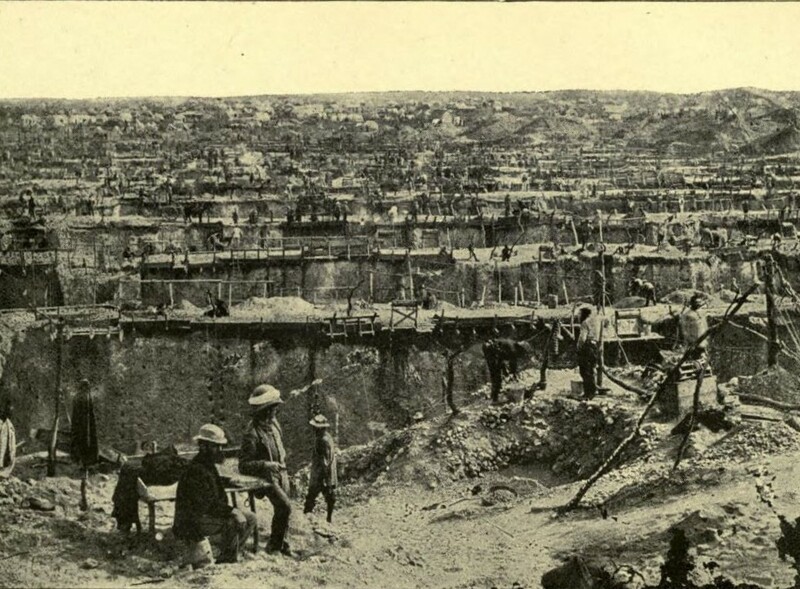 From mid-July 1871 to 1914 up to 50,000 miners dug the hole with picks and shovels, yielding 2,720 kilograms (6,000 lb; 13,600,000 carats) of diamonds. 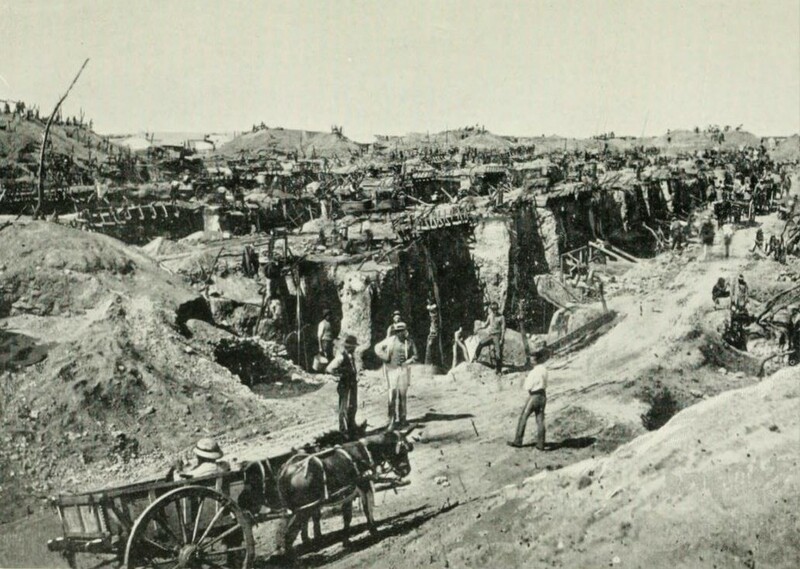 In 1872, one year after digging started, the population of the camp of diggers grew to around 50,000. As digging progressed, many men met their deaths in mining accidents. The unsanitary conditions, scarcity of water and fresh vegetables as well as the intense heat in the summer, also took their toll. On 13 March 1888 the leaders of the various mines decided to amalgamate the separate diggings into one big mine and one big company known as De Beers Consolidated Mines Limited, with life governors such as Cecil John Rhodes, Alfred Beit, and Barney Barnato. This huge company further worked on the Big Hole until it came to the depth of 215 meters, with a surface area of about 17 hectares and perimeter of 1.6 kilometers. Today, the Big Hole and its surrounds have been converted into a museum and tourist attraction. Visitors can go underground in a recreation of a mine shaft of the period and learn about the history of diamond mining in Kimberley, see historic memorabilia and buy diamonds slightly cheaper than usual. There is also a fascinating reconstruction of the ‘Old Town’ at the big hole that gives visitors an idea of what it was like to live there back in the town’s heydays of the late 1800s. 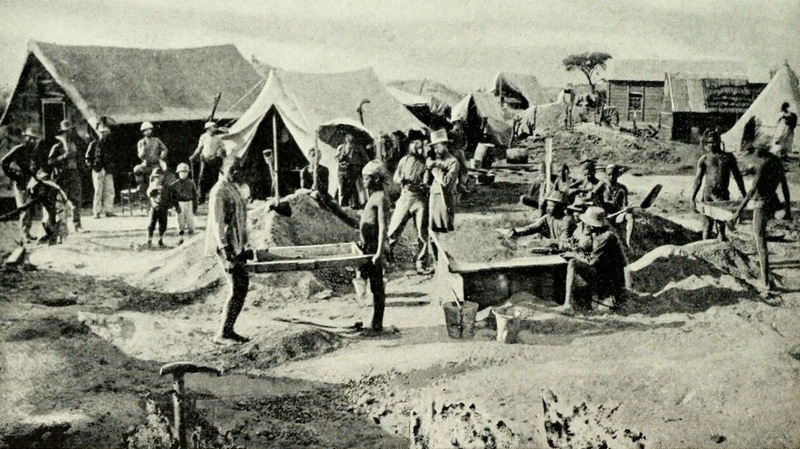 Very early photograph of Fleetwood Rawstorne’s Red Cap party of Miners working on Colesberg Kopje. This kopje was located on the De Beer Brothers farm Vooruitzicht. This kopje was the outer evidence of the ancient volcanic pipe and was to be mined down to the plain surface and then as an open cast mine to create the (Big Hole). In this photograph are all the tools of the trade -namely wheelbarrow, bucket, sieve, shovel and sorting table. A beard and red cap appears to have been de rigueur too. 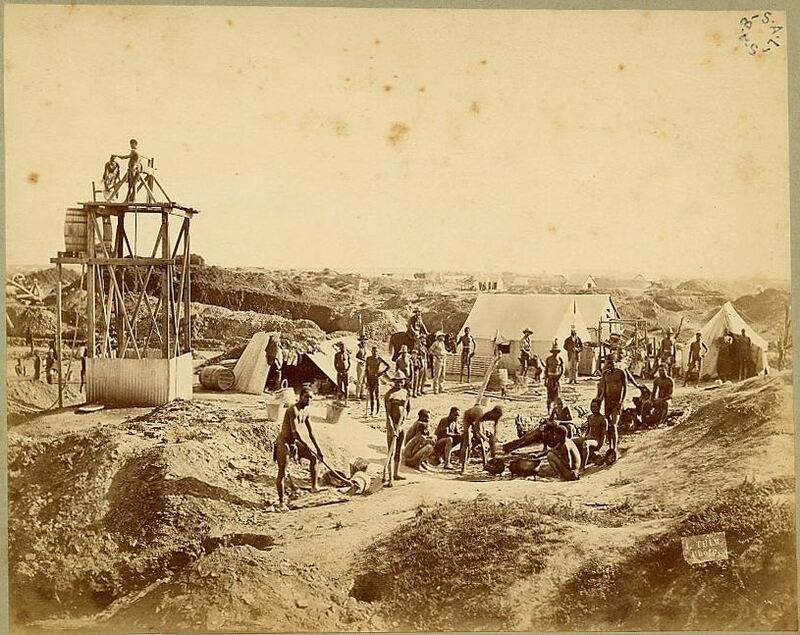 An early photograph of diamond mining, Diamond Fields, Kimberley Mine, 1871. 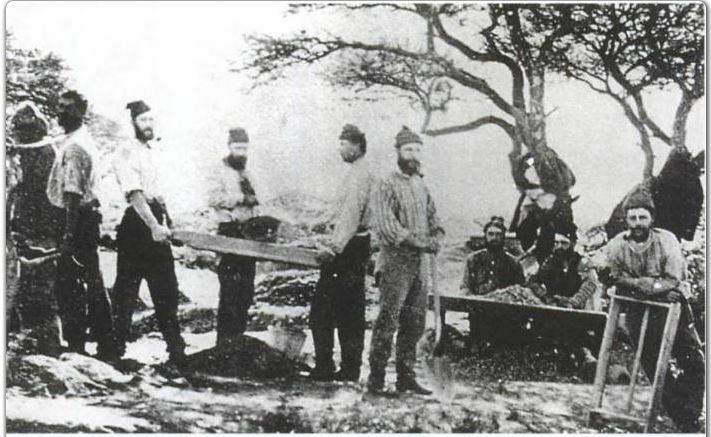 ‘Work Break’ – Early diamond mining days at New Rush (Kimberley). Loin-clothed black labourers sit down and around several tripots to eat. To the left of the image a small shaft has been sunken with an overhead gantry and winding gear. Sheets of corrugated iron prevent anyone falling into the shaft. The European Prospector sits astride his horse, while a fellow Miner appears to have a tethered baboon. Note the canvass tents used for sleeping quarters.